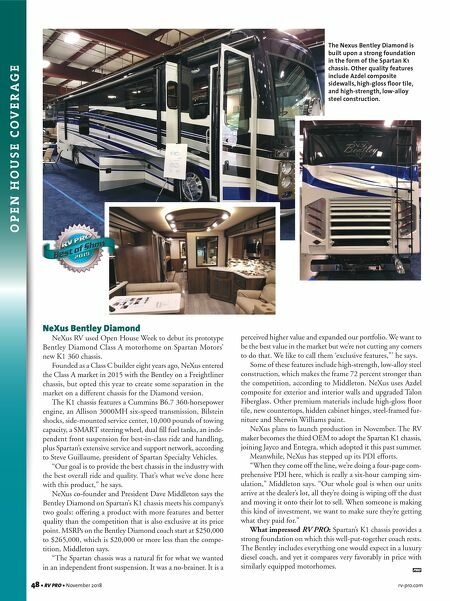 48 • RV PRO • November 2018 rv-pro.com O P E N H O U S E C O V E R A G E NeXus Bentley Diamond NeXus RV used Open House Week to debut its prototype Bentley Diamond Class A motorhome on Spartan Motors' new K1 360 chassis. Founded as a Class C builder eight years ago, NeXus entered the Class A market in 2015 with the Bentley on a Freightliner chassis, but opted this year to create some separation in the market on a different chassis for the Diamond version. The K1 chassis features a Cummins B6.7 360-horsepower engine, an Allison 3000MH six-speed transmission, Bilstein shocks, side-mounted service center, 10,000 pounds of towing capacity, a SMART steering wheel, dual fill fuel tanks, an inde- pendent front suspension for best-in-class ride and handling, plus Spartan's extensive service and support network, according to Steve Guillaume, president of Spartan Specialty Vehicles. "Our goal is to provide the best chassis in the industry with the best overall ride and quality. That's what we've done here with this product," he says. NeXus co-founder and President Dave Middleton says the Bentley Diamond on Spartan's K1 chassis meets his company's two goals: offering a product with more features and better quality than the competition that is also exclusive at its price point. MSRPs on the Bentley Diamond coach start at $250,000 to $265,000, which is $20,000 or more less than the compe- tition, Middleton says. "The Spartan chassis was a natural fit for what we wanted in an independent front suspension. It was a no-brainer. It is a perceived higher value and expanded our portfolio. 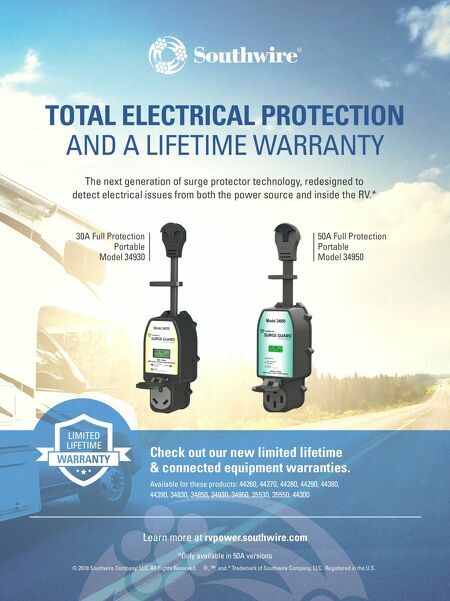 We want to be the best value in the market but we're not cutting any corners to do that. We like to call them 'exclusive features,"' he says. Some of these features include high-strength, low-alloy steel construction, which makes the frame 72 percent stronger than the competition, according to Middleton. NeXus uses Azdel composite for exterior and interior walls and upgraded Talon Fiberglass. Other premium materials include high-gloss floor tile, new countertops, hidden cabinet hinges, steel-framed fur- niture and Sherwin Williams paint. NeXus plans to launch production in November. The RV maker becomes the third OEM to adopt the Spartan K1 chassis, joining Jayco and Entegra, which adopted it this past summer. Meanwhile, NeXus has stepped up its PDI efforts. "When they come off the line, we're doing a four-page com- prehensive PDI here, which is really a six-hour camping sim- ulation," Middleton says. "Our whole goal is when our units arrive at the dealer's lot, all they're doing is wiping off the dust and moving it onto their lot to sell. When someone is making this kind of investment, we want to make sure they're getting what they paid for." What impressed RV PRO: Spartan's K1 chassis provides a strong foundation on which this well-put-together coach rests. The Bentley includes everything one would expect in a luxury diesel coach, and yet it compares very favorably in price with similarly equipped motorhomes. The Nexus Bentley Diamond is built upon a strong foundation in the form of the Spartan K1 chassis. Other quality features include Azdel composite sidewalls, high-gloss floor tile, and high-strength, low-alloy steel construction.